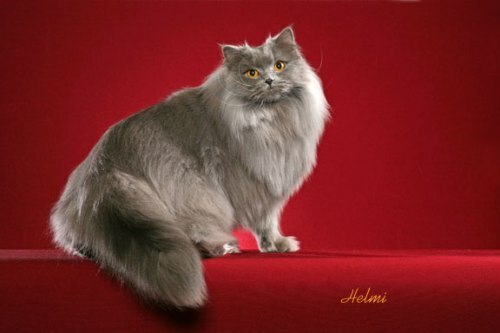 The British Longhair is much less well known than the British Shorthair but it is one of the most attractive cat breeds. Above: British Longhair Cat- Robyn – Photo ©copyright Helmi Flick – important: please respect copyright. 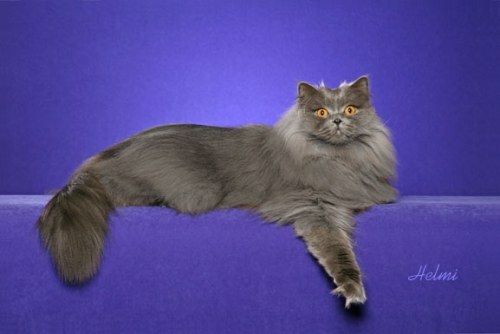 The stunning blue British Longhair illustrating this page is a companion to Bob and Lise Clark who live on Chestnut Run farm, with an orchard and small winery, in southern New Jersey, United States of America (date 2009). The Clarks have two cats, Robyn and Chepi. Chepi is a silver ticked tabby female American Bobtail. I would like to say how privileged and pleased I am to present, on this page, Helmi Flick’s beautiful photographs of a beautiful cat. About the 1900s in Britain, in order to make the British Shorthair more cobby (more rounded) and I guess more interesting (we need to change from what is normal) it was crossed with the Persian. The Persian and Siamese at that time were more exotic and interesting. Lets make the good old Brit SH more interesting too, I guess the breeders thought. After WWI the British SH breed had declined in numbers and the GCCF (the premier UK cat association) declared that only 3rd generation offspring of matings between Persians and BSH could be shown in cat shows. WWII reduced the numbers of the BSH too. Of the British Longhair cat, generally, even well known books such as the Legacy of the Cat and The Encyclopedia of the Cat don’t assist in researching the breed. Perhaps there is little to know except that this is a long haired version of the better known British Shorthair. This is supported by the fact that TICA (The International Cat Association, the 2nd largest) breed standard is the same except for hair length and hair descriptions. The longhair gene in cats is recessive, as mentioned, which means the cat needs 2 copies of the gene to have longhair. If a cat has one copy of the gene the cat is shorthaired. However, she can pass the longhaired trait to offspring. The presence of the carried gene will come to light when and if the cat is bred to another cat that carries the gene or to a longhaired cat. This breed has the general appearance of the flat face Persian (the ultra typed or extreme typed Persian) but is much better looking and more handsome, I believe. To many people the ultra Persian is ugly, I think it fair to say. The breed is also more healthy than the flat faced Persian as well. So what happened? There is a strong argument for the British Longhair to take the place of the flat faced Persian. See British Shorthair cat for a description of this breed generally. The point is that this breed could rehabilitate the Ultra type, extreme, Persian and maybe it is time that this happened. It would complete the circle. 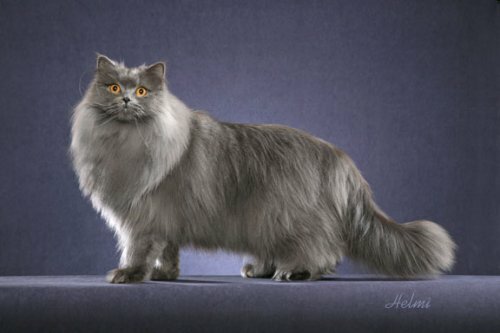 The flat faced extreme Persian should look like the British Longhair. Body: medium/large, muscular, cobby (see cat body types); chest, shoulders and back are “massive”; strong, short neck, legs are short and muscular; thick and round paws, tail is medium long/thick. Head: rounded, massive and broad; short nose; short muzzle. Coat: medium/long, dense and smooth, undercoat, crisp, ruff desirable, bushy tail. P.S. This page was first published in about 2010 or earlier. It is still relevant. I believe this breed needs more exposure which is why I have re-dated the post which effectively republishes it as of today’s date (21st Dec 2018). 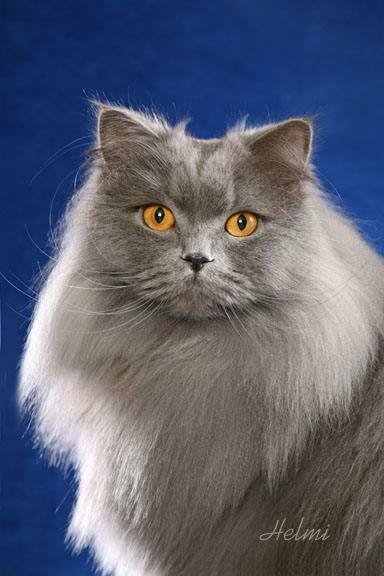 This entry was posted in British Longhair and tagged British Longhair Cat, British shorthair cat, cat breeds by Michael Broad. Bookmark the permalink.